Anyone who’s found the SV-POW! Tutorials useful will also like the excellent, detailed osteology posts on Tom Carr’s newish blog Tyrannosauroidea Central. Highly recommended — especially for those, like me, who have a lot to learn about skulls. 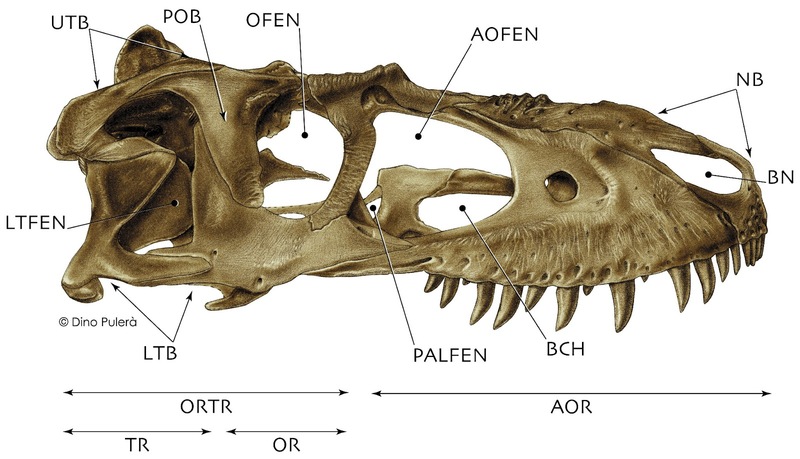 Composite skull of a subadult Albertosaurus libratus in right lateral view with the major openings and struts labeled. From the first of Carr’s blog entries, linked below. Perfect timing. Just as Carr and I engage in a Nanotyrannus THROWDOWN!! !… though I agree with him provisionally… and we’re ignoring Jane… and Alioramus messes us both up. More of a philosophical discussion I suppose.